On A Gray 'Day,' One Last Post-Apocalyptic Stand Set in a desaturated landscape ravaged by an unexplained cataclysm, The Day follows a band of five survivors as they evade predators in a farmhouse hideout. Not all is as it seems in this impenetrably bleak thriller, as critic Joel Arnold explains. In the post-apocalyptic film world, the tactic du jour for tipping off an audience that civilization and its inhabitants have all but kicked it seems to be simple color correction — specifically, zapping the frame of any lively hues and leaving behind a desolate palette of gray. Call it 50 shades of desaturated desperation. Recent genre entries Terminator Salvation and Book of Eli made full use of the ashen approach in presenting their faded futures, deadening things up even more with trashed highways and ruined cityscapes to boot. But if you're not a summer blockbuster and you're looking to evidence Earth-changing cataclysm on a tight budget, merely going gray is quick, dirty and usually effective. There are ways of overdoing it, however. In The Day, a savage B-movie thriller with unrealized aspirations to profundity, the monochrome choice is one of a few theoretically smart but ultimately extreme moves — even the spurting blood is a dull gray, and there's plenty of it. Using up its ideas too quickly and to excess, The Day initially focuses thoughtfully on the personal experiences of the living before taking a turn into darker, more senseless territory. Five weary, heavily armed survivors of an unexplained 10-years-gone Armageddon stop to investigate a farmhouse they discover while trekking through the wilderness. 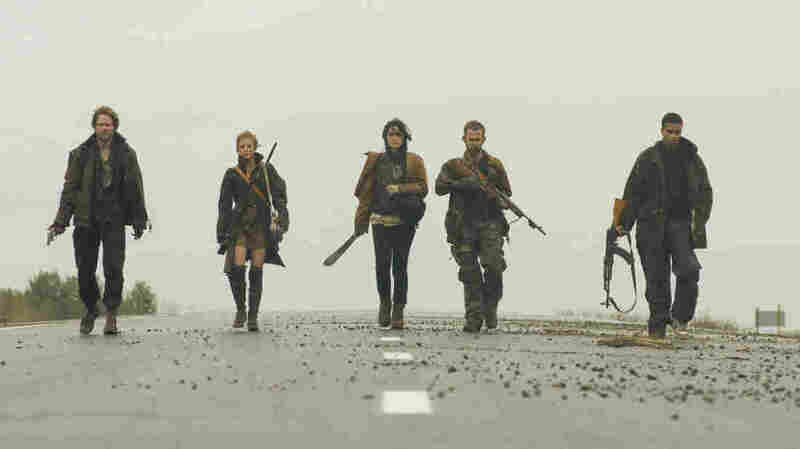 Led by Rick (Dominic Monaghan), the militant yet hopeful head of the downtrodden group, the five want to establish whether anyone has already claimed the place. Rick's easily agitated brother Adam (Shawn Ashmore) doesn't like the idea of sticking around, but the rest decide to hole up to take shelter from the rain and let Henson (Cory Hardrict), a high-school buddy of Rick and Adam's, recover from a fever and bad cough. Most of them use the time to be alone. Rick admires his valuable jars of vegetable seeds; Shannon (Shannyn Sossamon) uses a hole in the roof to shower; Mary (Ashley Bell), a quiet newcomer to the gang, takes quick drags from a short cigarette. More than the others — and even in safety — she appears to be constantly on alert, ever watchful, poised to defend herself. Each gaunt face and jumpy reflex reflects years of loss and pain, and for some that pain is more explicit. Adam's wife and daughter disappeared sometime after society broke down, most likely taken by bands of cannibals. Food is scarce, and hope scarcer. The faintly beating heart of the film may lie in how these people choose to live, despite what they've experienced; faced with little hope and scant purpose, they press on anyway, waiting for something to get better. They may keep each other going, but when Shannon insists they're a family, Mary looks on skeptically. Unnerved by knowing so little about this relative outsider, Shannon pressures Mary to fully commit to the group or risk leaving it. It seems an empty threat at first, one leveled by the most unhinged survivor, but as Shannon soon discovers, there is something about Mary. The farmhouse will turn out to be a lie, a booby trap meant to lure unsuspecting people to shelter and trap them there. A ringing heard for miles around signals a band of flesh-eating survivors (led by a disturbingly paternal Michael Eklund), and the stopover at the farmhouse becomes a siege. The snare outs Mary as a former member of one of the cannibal clans, and her trustworthiness, especially to Adam, is decidedly uncertain. Beginning like The Road but ending, after a grisly detour through Hostel territory, in a Night of the Living Dead-style onslaught, The Day evokes the best of its genre but doesn't hold up by comparison. Its characters are already so tormented by what they've seen and done that they can barely sympathize with each other, making it difficult for an audience to do the same. With the dire spectacle of 30 cannibals coming to eat them, they can barely muster reasons to keep fighting, obsessing instead over momentary gestures of vengeance or control. As the most compromised character, Bell gives a powerfully restrained performance that briefly elevates the film's uniformly bleak writing, and as Henson, Hardrict develops a welcome swagger as he picks off cannibals; it's an injection of much needed humor that comes far too late in the film. The Day attempts a few thoughtful stabs at what it means to be human when the only way to live is murder, but the utter oppressiveness of its visual and emotional landscapes overwhelms. With protagonists so callous and defeated, you may be left rooting for the cannibals — at least they really want to live.